Jukai / Lay Ordination at City Center on Friday, July 20, 2018. Congratulations to those receiving the precepts! Photo by Shundo David Haye. 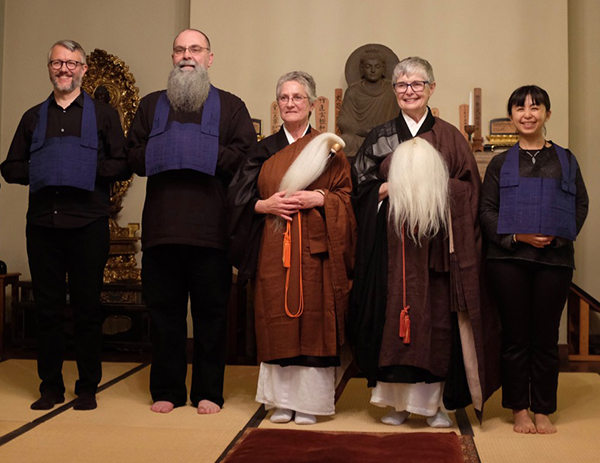 Left to right: Jonathan Kauffman – Yushin Gido / Courageous Heart, Faithful Way; David Alexander – Shingyo Dokaku / Sincere Practice, Path of Awakening; Kyoshin Wendy Lewis; Zesho Susan O’Connell; and Chia-Ying Chou – Myogyoku Genji / Luminous Jade, Source of Compassion. Also receiving the precepts were Greg Benza – Genchi Enjo / Profound Wisdom, Complete Accomplishment and Ash Benza – Mitsu En Kodo / Intimate Circle, Great Way.